Bruce Springsteen’s two most beloved albums are the Borns: to Run and in the USA. The former (his third album) was the album that propelled him to mega-fame and contains two tracks that Rolling Stone later ranked in the top 100 songs of all time, Born to Run and Thunder Road. The latter (his seventh album) is his most radio-friendly album and produced seven top-10 hits. The album’s songs contain the best realization of Springsteen’s poetic vision, which soon enough would be tarnished by disillusionment. He would later make different albums, but he never made a better one. The truth is, The Wild, the Innocent & the E Street Shuffle is one of the greatest albums in the history of rock & roll. It’s true — and underappreciated — that his stretch of albums from Born to Run to Tunnel of Love are very dark and desperate albums; bits of nostalgia and romance are undercut by brutal acknowledgment of the soul-sucking, unnavigable real world. The title track of Born to Run is widely heralded as one of the most romantic American rock songs, but its romance is an intentional, dramatic act in response to his paranoia of the “death trap,” the narrator’s dying hometown. Born to Run, in Bruce’s own words, is “the album where I left behind my adolescent definitions of love and freedom — it was the dividing line.” If you pay careful attention to the lyrics, they’re mostly about Bruce’s resentment of his roots and his irrepressible desire to transcend them. It’s a nice touch that the form matches the substance: Born to Run is the moment he fully escapes his initial persona of “Dylan imitator” and creates his most memorable sound and style. 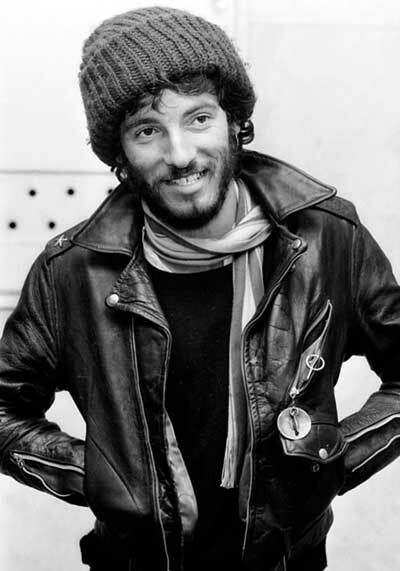 So most of the Bruce that ever gets played on the radio is after he lost his effortless, adolescent, spontaneous charm. Yeah, he has a lot to say about his crumbling hope for America, and lots of compelling ways to say it. But there’s something warm and unique in his his two pre-Born efforts: his romantic debut, Greetings from Asbury Park, and the follow-up, E-Street Shuffle, where he embraces the last moments of his youth as he bids it farewell. Asbury Park isn’t for everyone; his rhymes about “go-kart Mozart” and “South Side sisters” can be too cute at times. And listeners weaned on his heavily-produced, colorful sound from the mid-70s on may find the stripped-down album unsatisfying. But you can hear a fine young poet and musician building his chops and honing his vision. That work pays off on E-Street Shuffle which is fully-formed, diverse, and several leaps more mature and eloquent than Asbury Park. Again, it isn’t as accessible as his later pop, but it celebrates the small passions and victories of those drowning in modernity. From Born to Run on, even the happy moments of his darker, later career were usually coated in nostalgia and filtered memory.